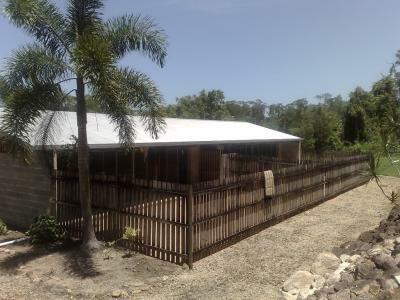 The Kennels are of block construction measuring 21 by 9 metres. Each Kennel is 2.1 metres high by 3 metres deep by 1.5 metres wide with solid block walls offering no intimidation from other guests. There is an open-sheltered outlook through the exercise yard to the rainforest. Dogs stay in one of four areas depending upon size, gender and behavior. Each area has 6 kennels with their own 10 by 6 metre direct access exercise yard. All yards and kennels have recorded surveillance and relaxing music to ensure your dog's comfort. UHF radio is also piped through the kennels, giving the guests a familiar voice when needed! We are members of the PIAA and operate within their guidelines. Meals are twice daily with a quality loaf/dry mix and a snack after exercise periods. We will discuss with you any special needs like diet, medication or exercise requirements before or on arrival. Just bring any instructions along, don't feel silly, it's all part of the pampering. Dogs are hydrobathed weekly and prior to departure. We only use top quality wash and herbal rinse products. Grooming is also available POA. Kennels, bedding and bowls are cleaned twice daily. Floors are washed with a natural insecticide to keep any nasties away! We live on site and try our very best to ensure every guest receives the same level of comfort and happiness as at your home. Familiar bedding and toys may help, if necessary your own vet can be on call, or our 24/7 local vet. Peace of mind, knowing that your loved ones are safe and happily cared for. We're just a phone call away. Holiday updates are welcomed. Your best to phone between 6am and 11am Monday to Saturday or phone our mobile phones after 11am. For the protection of all dogs a current C5 Vaccination card must be provided on arrival before boarding and all dogs must be free from FLEAS and TICKS.